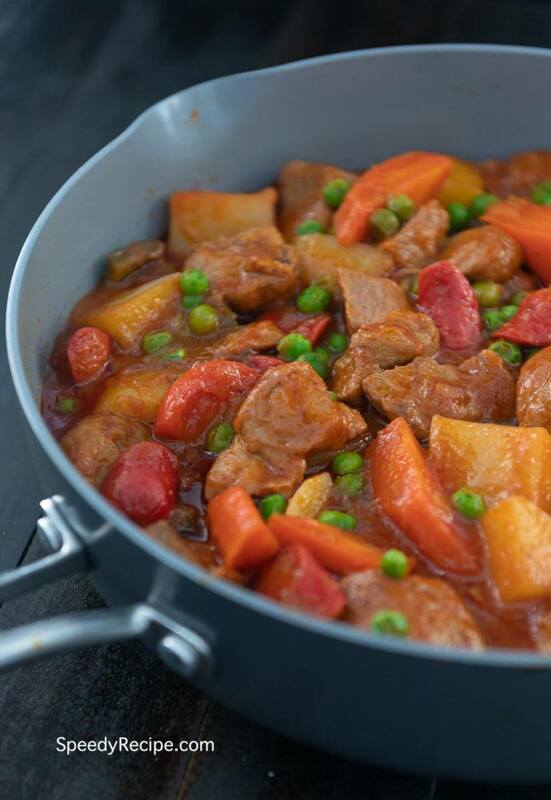 Pork Afritada is a type of Filipino pork stew. It is composed of pork slices along with hotdog, potato and carrot. This is usually prepared on regular days for lunch or dinner. It is best eaten with warm white rice. Cooking pork afritada is almost the same as cooking any other Filipino stews such as pata hamonado. Begin by sauteeing garlic and onions. This is the basic way to cook most dishes in the Philippines. These two ingredients act as aromatics that contribute both flavor and aroma to the dish. You may choose to put the garlic first before the onion. It is really a matter of personal preference. I like the roasted taste of garlic in my stew. This is the reason why I added the garlic first and waited for it until it browns before putting-in the onion. Add the cubed pork next. It is best to brown the pork by sauteeing before adding the tomato sauce and broth. This is also the step wherein bay leaves are added. 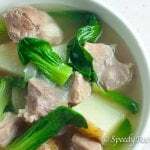 Tenderize the pork by boiling in broth using low to medium heat for 30 to 40 minutes. You may cook it longer if necessary. A slow cooker version of this dish is simply putting everything together in a slow cooker and slow cook for 6 hours. This version makes use of hotdogs. The red variety is mostly used. This is the common hotdog variety used in the Philippines. You may still cook afritada without it. Add hotdogs along with potato and carrot. Cook for 12 minutes. The frozen green peas are added before the seasonings. Continue to cook for 5 minutes before seasoning with salt and ground black pepper. Sometimes I also use fish sauce as an alternative to salt to get that Umami taste. 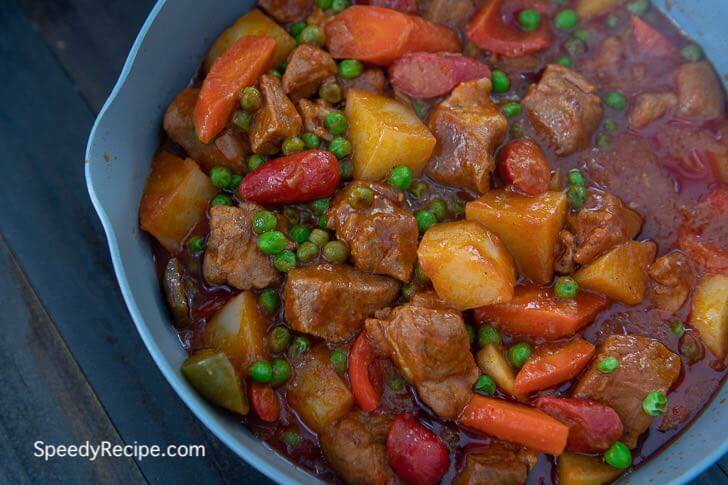 Try this Pork Afritada Recipe. Enjoy! Pork slices and hotdogs stewed in a tomato based sauce with potato and carrot. This delicious dish is best enjoyed with warm rice. Heat oil in a pot. Sauté onion and garlic. Add pork when onion softens. Continue to cook until light brown. Add tomato sauce. Pour pork broth. Let boil. Add bay leaves. Cover and cook for 30 minutes. Add hotdog, carrot and potato. Cook for 12 minutes. Add green peas. Cook for 5 minutes.